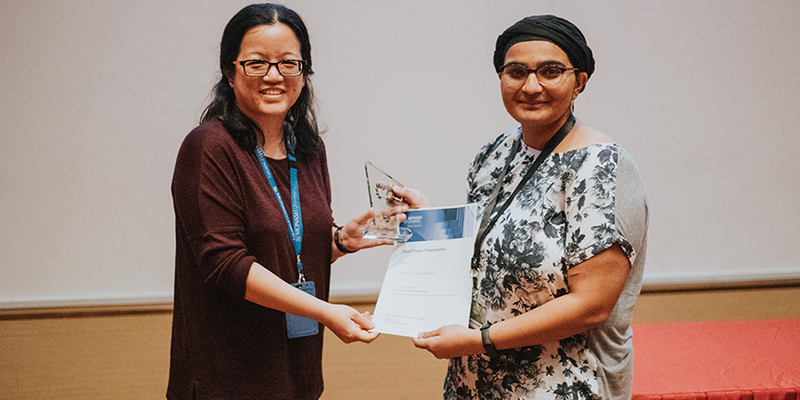 The Monash Science Symposium (MSS) 2018 was held from 21 to 23 of November 2018 at Monash University Malaysia, Subang Jaya. This annual symposium, organised by postgraduates from the School of Science, connects researchers, academicians and industrialists from around the world and hence, one of the most highly anticipated events among the scientific community in Malaysia. The programme also provides a platform for participants to present their studies, explore their potentials, exchange inspiring ideas and establish professional relations with other universities and the industrial sectors. This year University of Nottingham Malaysia School of Biosciences second year PhD student Jennie Unnikrishnan won the Award for the Best scientific poster at the MSS, for her poster on ‘Systematic analysis of reproductive development in oil palm flowers and fruit.’ She is undertaking this research under the supervision of University of Nottingham Malaysia’s Professor Festo Massawe Professor Zoe Wilson and University of Nottingham UK academic Dr Sean Mayes. Heartiest congratulations to Mrs Jennie, on the award, which is a testament to the high quality of research carried out by students at UNM.